The main structure castings of the machine are manufactured from high quality cast iron, stress relieved for lifetime stability of material. One-piece Fabricated bed construction features increased rigidity and superior machining stability. The headstock is ruggedly constructed to resist heavy turning with excellent heat dissipation performance. 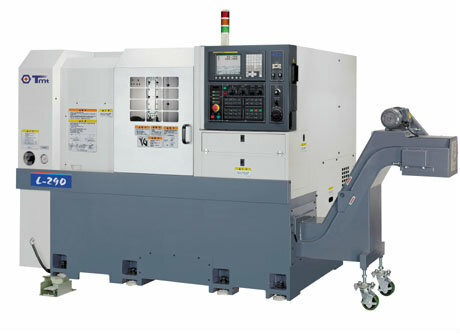 Equipped with 3,000/4,200 RPM precision spindle. The spindle has a labyrinth circulation design to prevent moisture and dust from entering into the spindle. The machine structure is designed by means of CAD computer software. Advanced CAE computer software is also applied for optimal structure design. In addition, this software also provides analysis of dynamic, static stress and thermal stress. Box way surfaces are hardened and precision ground. The electronic parts and connectors meet the rigorous military specifications and industrial specifications. These top quality electronic parts provide extremely stable control performance and long service life. Outstanding control circuit layout combines with modular design to simplify maintenance, while ensuring control performance at all times. The coolant system is designed with oil fluid separation to prevent coolant from deterioration or odor.